The World Health Organization describes interprofessional education as the process that occurs when two or more professionals learn about, from, and with each other to enable effective collaboration and improve health outcomes. On Friday, January 17th, over 350 medical, nursing, and health administration students gathered on Georgetown’s campus to put into practice the ideals of interprofessional/interdisciplinary education. Over the course of the day, students shared their positive and negative thoughts on the various roles in the healthcare system. This exposed the learners to the biases and perceptions that are at play every day in the healthcare world. While listening to safety stories, completing a risk cause analysis of a healthcare event, and analyzing real life hospital cases, the students were able to realize the importance of having professionals with a variety of perspectives working together to solve a problem and improve health outcomes. What do health administrators even do? This question was asked more than once during Interdisciplinary Educational Experience (IDEE) and clearly demonstrates the need for better understanding among the various players in the healthcare field. 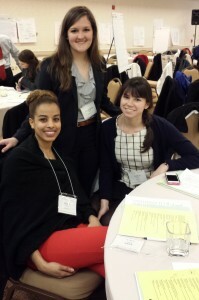 Student, Caitlin Crooks (G’15) showed great appreciation for the chance to work in a diverse setting and stated, “…taking an interdisciplinary approach may very well be the key to successful healthcare outcomes.” The professors and instructors leading the students through this interprofessional experience agreed. Students graduating from Georgetown University will benefit from the interdisciplinary approach the various health related programs are taking. Learning how to navigate the complex world of healthcare effectively can be accomplished by learning from workers at every level of care, from the C-suite to the operating room. Dr. John Jacocks (top) explains the CT Scan to MHSA students, (below and from left to right) Devi Kumar, Tiffany Hoang, Megan Cook, Ting Yang, Caroline Stevens, and Vanessa Boadi. 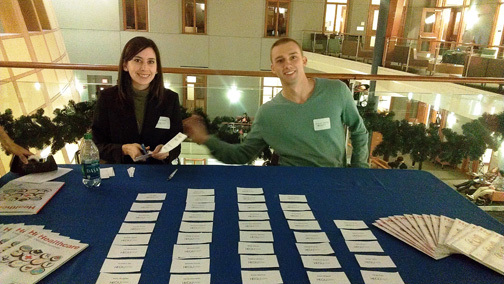 On January 9-10, Georgetown’s Masters of Health Systems Administration (MHSA) class of 2015 made the DC VA Medical Center their temporary home in an effort to learn medical terminology and experience the on-call life. Hosted by Raya Kheirbek, MD, of the DC VAMC, the students, led by professor Ryung Suh, MD, MBA, MPP, MHA, John Jacocks, MD, MTM&H, and Samuel Jang, DO, MPH, spent thirteen hours poring over basic word structure, various systems in the body, different pathologies, and touring the facility. Dr. Suh summarized the purpose of this overnight class as “to experience the overnight on-call experience as a professional.” “You will be tired,” Dr. Suh said, and he was right. After viewing the proposed schedule for the overnight class, student Vanessa Boadi (G’ 15) jokingly pointed out that they must have forgotten to schedule time for a nap. Future healthcare administrator and classmate, Marta Lema (G’ 15), said that the willingness of doctors and nurses to shift their entire lifestyle and schedule to care for people in need speaks volumes of their dedication. Students were able to relate this overnight experience to valuable lessons learned in classes such as Organizational Leadership, taught by professor Mary Jane Mastorovich, MS. A recurring theme of the class was the need for leaders who are able to empathize with the experience of various employees. Grueling hours and overnight shifts are the daily (or nightly) realities for many clinicians. This class allowed students to gain firsthand knowledge of the toll these shifts take on healthcare professionals. By Rahab Manyika (G’ 15), School of Nursing & Health Studies. Stephen Miller (G’14) and Megan Graves (G’14) – who are earning a master’s degree in health systems administration – were named second runner-up and runner-up in an essay contest sponsored by the National Capital Healthcare Executives. 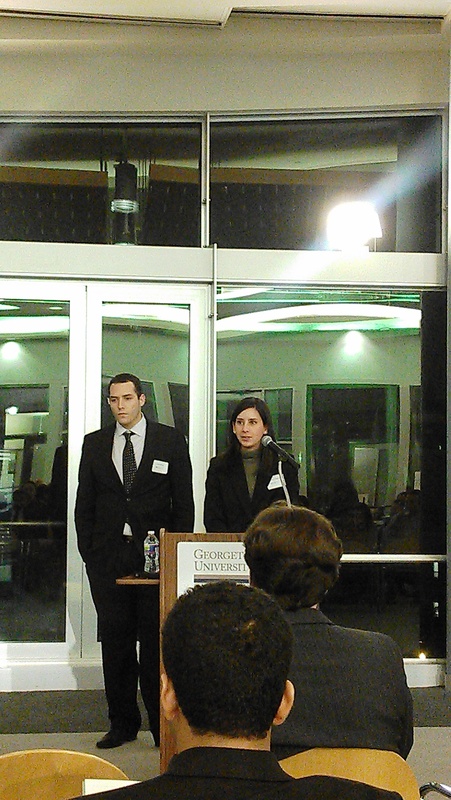 NOVEMBER 20, 2013 – Two Georgetown University graduate students received awards through an essay contest sponsored by the National Capital Healthcare Executives. Megan Graves (G’14) and Stephen Miller (G’14) – who are earning a master’s degree in health systems administration (MHSA) at the School of Nursing & Health Studies – were named runner-up and second runner-up, respectively. The awardees were announced November 8 during the organization’s annual C-Suite Roundtable, held this year at George Washington University. 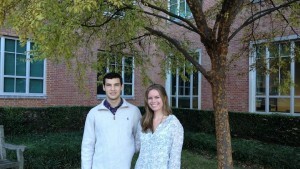 Students were asked to submit an essay describing how – as health care leaders – they would use a donation to implement a health-oriented program that would result in positive change in their community, as well as a description of the area of community health that would be improved and its importance. The focus of Graves’ essay was mental health in Rhode Island, specifically on raising awareness of mental health and the education of children through a pilot program in Providence public middle and high schools. The program would educate teachers and administrators to become mental health wellness coaches. Miller proposed establishing safe walking and biking paths throughout the city with the hospital as a center point to improve community health by increasing physical activity among community members and employees. In addition to the announcement of the essay contest winners, the evening included a panel discussion with health care leaders who discussed integrating the principles of patient-centered care. Speakers included Gary E. Vogan, MBA, president of Holy Cross Health Network; Douglas Grimm, LLM, JD, MHA, FACHE, chair of the Health Care Practice at Stradley Ronon; and Christopher Khoury, MBA, MS, senior Manager in PricewaterhouseCoopers’ Health Research Institute. Tammie Jones, FACHE, chief of staff and chief operating officer at Fort Meade Medical Activity, moderated the panel. Master’s program director Bernard Horak, PhD, FACHE, professor of health systems administration, says the roundtable is a highlight of the academic year. On Friday, September 13th, students from four different universities gathered together to listen to some of the most influential and experienced professionals in the field of healthcare administration. 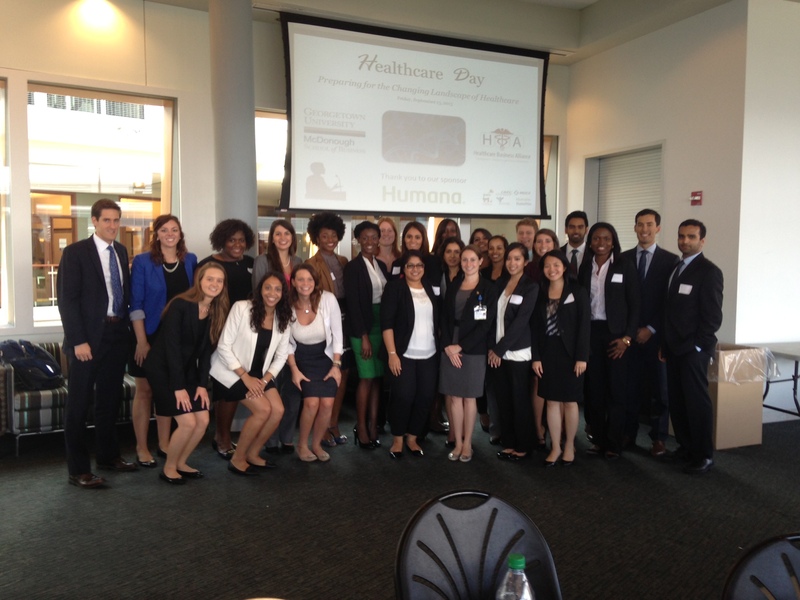 Students in MBA, MHA, and MHSA programs from Georgetown University, The George Washington University, The University of Maryland, and The Johns Hopkins University came together to gain knowledge and insight from professionals in the healthcare industry. To close out the day, a panel of alumni students from both the Masters in Health Systems Administration at Georgetown and the Masters in Business Administration at Georgetown provided post-graduation experiences and advice, as well as how healthcare-focused programs provide the necessary knowledge to become a future leader in the healthcare industry. 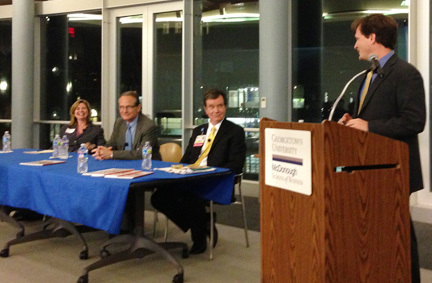 Panelists ranged from consultants to legal councils, to VP of patient affairs. 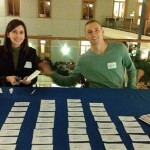 “The event was exceptionally informative. I was most impressed with the variety professionals that were present on the panels. 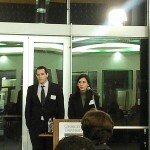 The speakers did an excellent job explaining their careers and the steps they took to get there. Also, they provided sound advice for entering the health care industry as well as their projections for the future of healthcare” said Christopher Morehouse (G’15 MHSA). 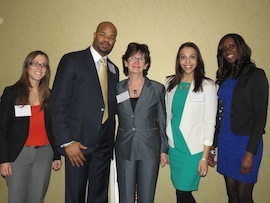 Before the event, Al Campbell, MHA, MBA, president-elect of NAHSE, and Patricia Cloonan, PhD, chair of the Department of Health Systems Administration, posed with students in Georgetown’s master’s program in health systems administration, including Karla Gonzalez (G’14), Alya Ibrahim (G’14), and Sunbo Igho-Osagie (G’14). A successful event March 21 provided Georgetown students with the opportunity to interact with high-ranking minority health care executives from the Washington, D.C. area. More than 100 people gathered in the Georgetown University Hotel and Conference Center for the 2013 Minority C-Suite Executive Roundtable, hosted by the National Association of Health Services Executives (NAHSE) Washington Metropolitan Area Chapter and co-sponsored by the Department of Health Systems Administration. Al Campbell, MHA, MBA, president-elect of NAHSE and vice president for quality, risk management, and ancillary services at the Specialty Hospital of Washington, says the association has had a long relationship with Georgetown’s department and its chair Patricia Cloonan, PhD. “I’m a firm believer that if we want to continue to be successful in our organizations we have to retain talent while they’re young,” he says. Cloonan, one of the event co-chairs, says the experience builds upon her department’s commitment to providing students with diverse career and networking opportunities. 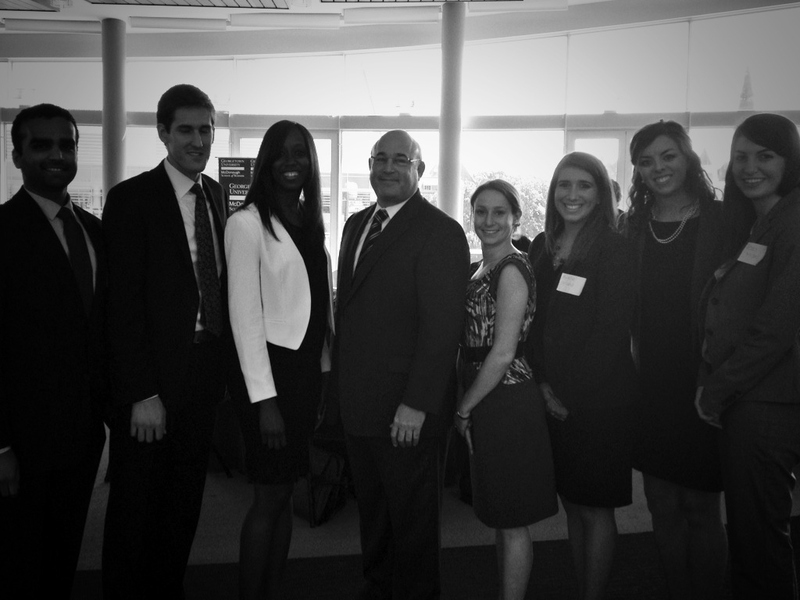 In recent years, as an example, the department has supported teams of students for competition in NAHSE’s Everett V. Fox Student Case Analysis and Presentation Competition. In 2010, Georgetown’s team won first place. Thursday’s event, she says, also allowed the graduate students who participate in the student organization HEGU, or the Healthcare Executives of Georgetown University, to build a formal and ongoing working relationship with NAHSE. Kenneth Grant, MS, vice president for general services and supply chain management at Johns Hopkins Health System, moderated the eight-member C-suite panel. The “C-suite” generally consists of executives who hold high-ranking positions within organizations. Panelists represented organizations such as PricewaterhouseCoopers, Howard University Hospital, AARP, Children’s National Medical Center, the Specialty Hospital of Washington, MedStar Washington Hospital Center, Furst Group, and UnitedHealthcare. They shared perspectives on diversity in health care organizations and key leadership skills to prepare for executive-level roles, such as business acumen, an orientation toward excellence, and empathy. 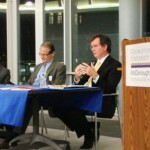 Panelists also discussed the value of focusing on the patient experience and health care reform. “Each of the panelists gave incredibly inspirational advice, focusing on the continuous learning, the importance of soft skills such as empathy to lead to success, and striving for excellence above all,” she says. 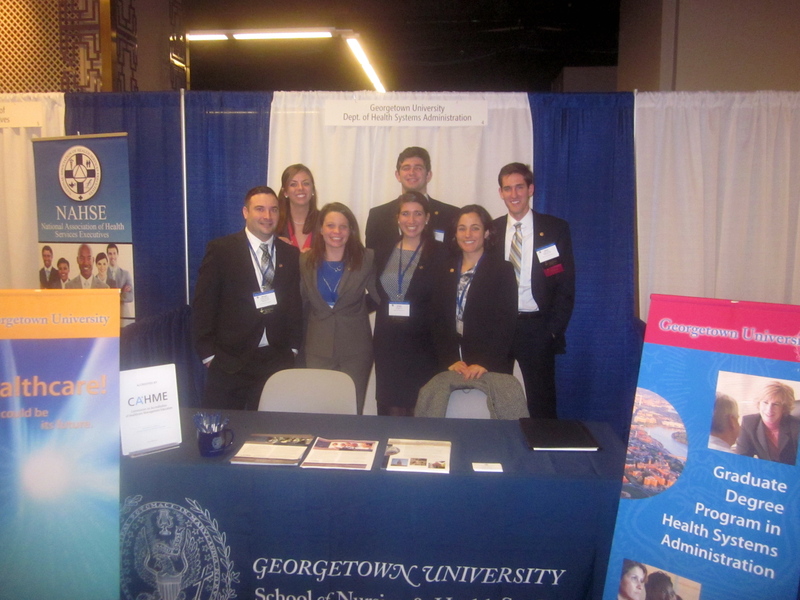 Georgetown students attending the American College of Healthcare Executives’ recent Congress on Healthcare Leadership say the opportunities for professional development were plentiful. Master’s degree students from the Department of Health Systems Administration staffed Georgetown’s booth during the American College of Healthcare Executives’ recent Congress on Healthcare Leadership in Chicago. 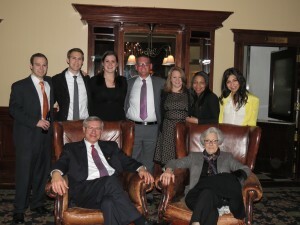 This year, the Department of Health Systems Administration sent nine students to the major event in Chicago, held March 11-14, and again hosted an alumni dinner for program graduates in attendance. M.J. Mastorovich, MS, assistant professor of health systems administration, and Bernard Horak, PhD, FACHE, professor of health systems administration and program director, accompanied the students. “Our program offers students important opportunities like attending the congress so that they can engage with industry leaders, connect what they are learning in the classroom with trends in the health care sector, and meet young alumni from the program who often have valuable career advice to share,” says Patricia Cloonan, PhD, the department’s chair. Students had the opportunity to attend executive-level sessions on topics such as patient-centered care and best practices for community needs assessments, as well as attend sessions to help them learn the leadership and professional skills needed to be successful in the field. Participants note that the ACHE Congress provided significant opportunity to investigate career opportunities – ranging from finding the right administrative residency and discussing career goals, to career counseling with an executive. Jason Ormsby PhD, MBA, MHSA, assistant professor of health systems administration, hosted a session prior to the congress to educate MHSA students on best practices for meeting and networking with professionals. Alumni from the master’s program in health systems administration attended a special dinner along with current students and, seated at front, Bernard Horak, PhD, FACHE, professor of health systems administration and program director, and M.J. Mastorovich, MS, assistant professor of health systems administration. The department annually hosts an alumni dinner during the congress. Again this year, the department hosted an alumni dinner for program graduates attending the congress. During the congress, student participants staffed a Georgetown booth to showcase the educational programs offered at the School of Nursing & Health Studies. 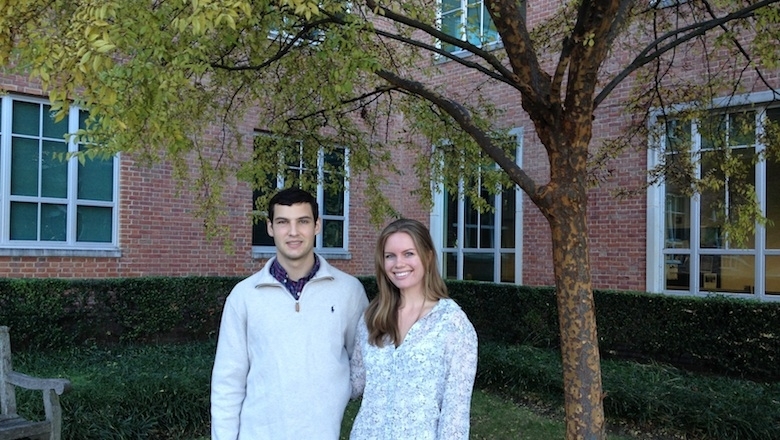 Baddoura and Aaron Polacek (G’14) also served as student program assistants for the congress. “I enjoyed most the instances when I saw a student or an executive multiple times during congress, and it always stemmed from me being a congress program assistant and either working with them or welcoming them to one of the events and having a conversation with them,” says Polacek. An innovative opportunity allowed 20 MHSA students to spend 15 hours at the Washington DC VA Medical Center learning about the language of health care and medicine. Ryung Suh (M’98, G’98, MBA’03), MD, MPP, MBA, MPH, associate professor of health systems administration, led the master’s students through the dynamic overnight session on Nov. 29-30. Suh also noted that the session aimed to simulate the long hours and the demanding experience of being “on-call” overnight within a hospital in order to broaden the students’ perspectives. 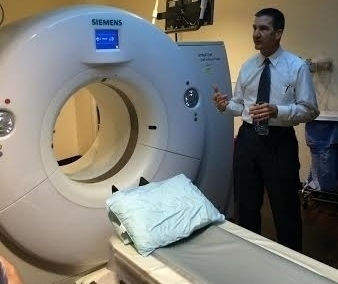 Finally, he said, it sought to provide context for the medical terminology the students were learning by visiting parts of the hospital where those terms are most commonly used. The Department of Health Systems Administration is known for providing its students with dynamic experiential learning opportunities – from residencies and executive mentorships, to case competitions and real-life quality improvement projects. Patricia Cloonan, PhD, the department’s chair, said the overnight experience builds upon this strong foundation. Student participants – despite the long hours – said the experience was well worth it. “It was a well articulated deep dive into the staggering amount of medical information providers must compartmentalize and access regularly,” said Jade Wood (G’14). Classmate Stephen Miller (G’14) added that the experience helped build camaraderie. “Not only was it a great way to learn the medical terminology that is necessary for administrators to communicate with clinicians, but it was also a fun opportunity to bond with our classmates and professors outside of the typical classroom setting,” he said. Suh expressed his gratitude to the administrative staff at the medical center who made it possible for this educational experience to occur – including Raya Kheirbek, MD, who specializes in geriatric medicine, Brian Hawkins, facility director, and Joseph Davis, administrative officer. 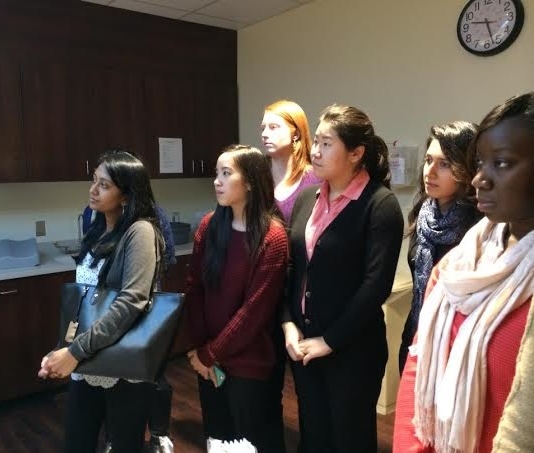 On Friday, February 15, students from Georgetown University’s Master’s of Health Systems Administration department visited Asbury Methodist Village, a continuing care retirement community (CCRC), in Gaithersburg, Maryland. Georgetown’s MHSA students were joined by students from George Washington University’s Masters of Health Services Administration program. Asbury Methodist Village is the 12th largest CCRC in the country. Asbury’s leaders of each department welcomed the students and took turns discussing responsibilities and challenges that each one faces in today’s health care system. Students asked questions regarding the implications of the Affordable Care Act on their organization. The Executive Director, David Denton also discussed the strong need for young leaders to choose long-term care as their career path. Each department director gave the students a tour of their department, highlighting the variations of resident homes and dining choices. The students were also shown the medical units on campus. Asbury Methodist Village houses nearly all outpatient services needed on campus, though residents can choose to see providers off campus as well. Several residents from Asbury Methodist Village’s independent living facilities joined the students for lunch. These resident’s shared their perspectives on the community and the services offered. Students also enjoyed asking questions about the resident’s backgrounds and life experiences. Georgetown University MHSA students are looking forward to continuing the partnership with both Asbury Methodist Village and George Washington University students. 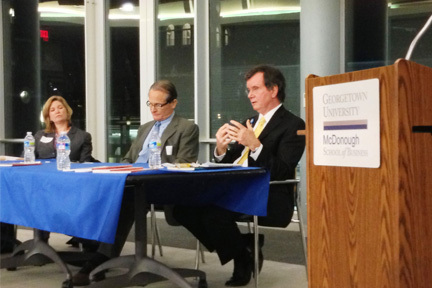 On Tuesday, November 27th the Healthcare Executives of Georgetown University (HEGU) hosted its final speaker series event for 2012. The speaker series roundtable featured three guest panelists that discussed their views and experiences in the changing healthcare field. The event, sponsored in part by the Healthcare Business Alliance, was held in the Fischer Colloquium of the Rafik B. Hariri Building. Over 50 people were in attendance. 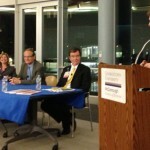 The panelists represented some of the biggest sectors in the healthcare inside and outside of the hospital. Discussion centralized around how costs drivers shift the traditional paradigm of care, and was moderated by Jason Ormsby, faculty member in the Department of Health Systems Administration. The three panelists included Matt Walton, Chief Executive Officer and Co-Founder of SAMI Health, Inc., a company created to bring advanced, cross-platform search technology to the world of electronic medical records. Walton discussed how his technology helps reduce costs in the hospital setting through improved quality identification. 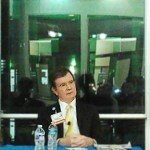 Sandy Robinson, Vice President of Avalere Health, was included as a panelist. Robinson provides strategic and tactical advice to life sciences clients, focusing on specialty drugs, diagnostics and devices. 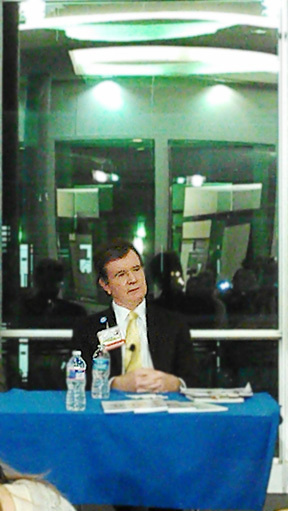 The final panelist was Dennis McIntyre, MD, FAAP. Dr. McIntyre serves as the Associate Medical Director of Case Management and Utilization Review at MedStar Georgetown University Hospital. Dr. McIntyre was able to speak on his experience as a physician and the challenges that currently face MGUH. Pictures courtesy of Kara Jose and Daniel Bitman. 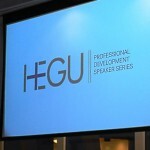 As a part of its professional development speaker series, the Healthcare Executives at Georgetown University (HEGU) hosted its annual Undergraduate Roundtable Panel, featuring alumni from the Health Care Management and Policy undergraduate program at the School of Nursing and Health Studies. 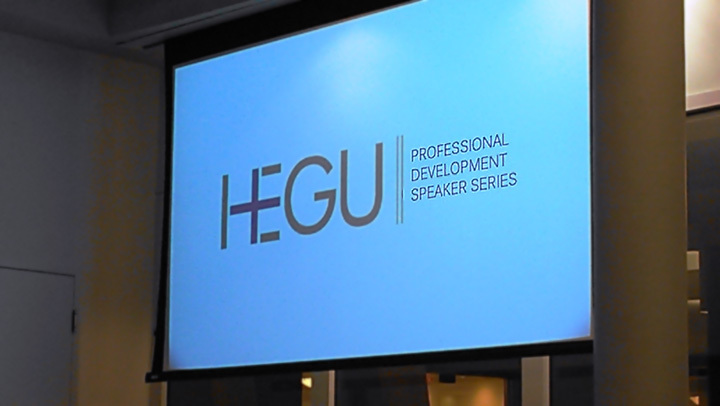 The event was organized by the HEGU Undergraduate Representative Caitlin Koury (HCMP ’13) and moderated by Dr. Goldenberg, an adjunct professor in the Health Systems Administration department. Dr. Goldenberg also teaches all of the undergraduate students in ‘Health Care in America,’ an introduction to health care systems class. Both undergraduate and graduate students attended the event and listened to the experiences of the recent graduates throughout the healthcare field. The panel included Melissa Conners (HCMP ’11), Gregory Fitzgerald (HCMP ’12), Melissa Higdon (HCMP ’07), and Sunny Hwang (HCMP ’09). The featured panelists currently work in different areas of healthcare, including hospital administration and healthcare consulting. Throughout the event, they discussed their positions and duties, as well as offered advice to attendees about where to look for jobs. The panelist also described how students can focus their education now to help them in the future and how to create a good foundation for their careers through work experience.